1. 2 inch TFT color screen to review photos and videos. 2. 36pcs IR LEDs for flash range up to 20 meters . 3. Programmable 5 / 8 / 12 megapixel high-quality resolution . 4. Colorful pictures during day, black and white at night . 5. Adjustable PIR sensitivity: high, middle, low . 6. Impressive quick trigger time: 0.7s . 7. Multi-shot pictures: 1, 3, 6, 9 . 8. Adjustable delay between motions: 1 / 5 / 10 / 30 seconds / minutes . 9. Adjustable video length: 10 / 30 / 60 / 90 seconds . 10. With 8 AA alkaline batteries, the longest standby time is up to 6 months . 11. Available operation temperature: -20 to 60 Deg.C . 12. 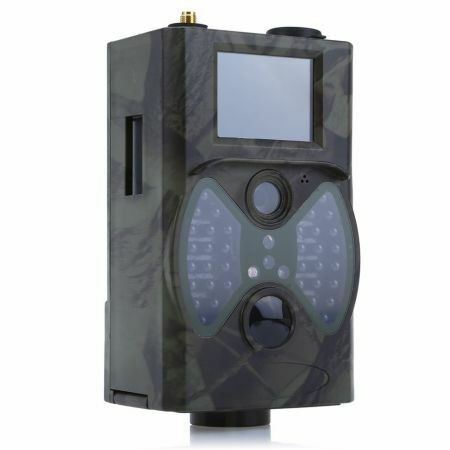 With specified timer, camera can be programmed to work only during preset time period every day . 13. Stamp of date, time, temperature and moon phase on every picture . 15. Support 2G SIM cards to get real-time photos . 16. With MMS / SMTP function, camera can transmit photos to 1 - 4 preset mobile phones or 1 - 4 email per trigger . 17. SMS to enable camera to shoot a photo and send back instantly, ask camera to work or not work, get number of taken pictures and battery status . 18. Support language: English / Spanish / Russian / Italian / French / German / Danish / Dutch / Polish / Portuguese / Swedish / Finnish . 19. Opening attention: in order to wake up the camera, please put the opening button on the TEST mode at first, wait for 1 to 5 seconds, then move the button to the ON mode. At that time, the camera is in the state of working. 20. TF card insertion: before operating this machine, please keep it be in power, then insert TF card. Finally, it will perform well .